Maria Callas was the most glamorous, idolized and criticized operatic figure of our time. Loved or hated, no singer inspired so much discussion, nor exercised as much power at the box office as the “ugly duckling” who triumphed over a bitter childhood to become the Queen of Opera. 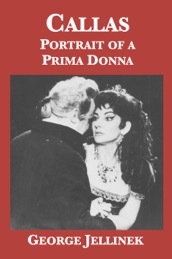 Written in 1960, this is a portrait of the artist at the height of her fame, and includes an epilogue that extends the story to Callas’ death in 1977 and her posthumous glory.